We love these Playmobil sets! We reviewed Lucky's Happy Home from Playmobil at Christmas. Imaginative play is important to your child's development and the Playmobil sets offer so much imaginative and fun play. I am happy to see the Tiny Paws Pet Hotel! How cute is this?? Take your pet for a relaxing stay at the Tiny Paws Pet Hotel. Here your pet will feel right at home and will be well cared for. Inside the front doors, the staff at the reception desk are ready to welcome your pet. Easily store your pet’s food in the shelves above the desk or in the kitchen, where tasty meals are prepared for all the pet guests. Outside, your furry friend can run around the spacious, fenced-in yard or try out the seesaw. Your feathered companions will also enjoy their perch outside in the fresh air. Use the included stickers to brighten the décor. For even more fun, combine this set with the rest of the PLAYMOBIL Pet Hotel theme ( sold separately)! 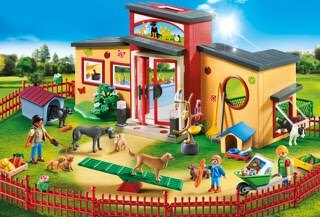 Set includes three figures, eight dogs, two birds, two doghouses, bench, seesaw, wheelbarrow, dog food, birdseed, and many other accessories. Makes the perfect gift for kids!